At SunPower, we are always striving to do better. Better design, with better technology. Better for our customers. 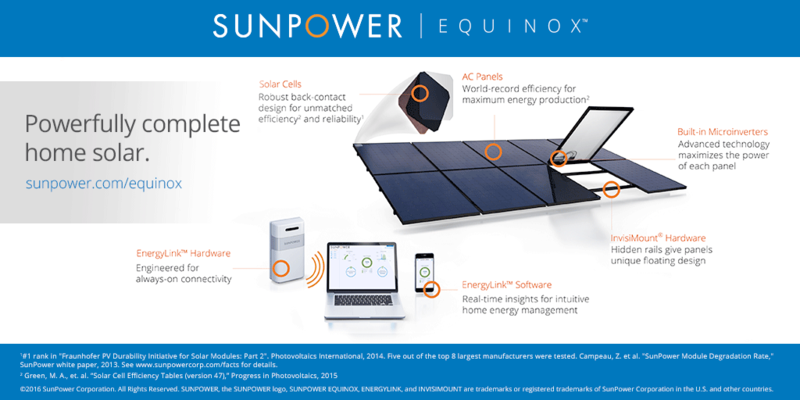 When it comes to home solar, no company has ever designed anything like the SunPower© Equinox™ system. Our design challenge was this: Take the complex — converting energy from the sun into clean electricity for your home — and make it simple, elegant and powerful. SunPower has a fundamentally different approach to solar product design: We thoughtfully design and engineer complete solar solutions with each component working in harmony. This helps us eliminate unnecessary parts and steps and design with system-level goals in mind, such as power, reliability and aesthetics. We’ve done it for solar power plants, we’ve done it for commercial solar, and now we’ve built the market’s first all-in-one complete home solar system. The result is a game-changer for home solar: A system specifically designed to deliver 70 percent more energy in the same space over 25 years1 with 70 percent fewer visible parts,2 all backed by one company with one warranty. This means you can own the most efficient3 and reliable4 home solar power system available that also complements the beauty of your home. And because we’ve designed the SunPower Equinox platform from start to finish, we stand behind your entire home solar experience from beginning to end with the best Combined Product and Power Warranty — also all from one company. This product is a true testament to our design philosophy: When technology is designed to work together, it works better. And that’s better for our customers. Visit the SunPower Equinox™ web page to learn more. Use our solar calculator to find out how much you could save going solar with SunPower. 1 SunPower 345W, 21.5% efficient compared to a Conventional Panel (250W, 15.3% efficient, approx. 1.6 m2), 9% more energy per watt, 0.75%/yr slower degradation. BEW/DNV Engineering "SunPower Yield Report," 2013 with CFV Solar Test Lab Report #12063, temp. coef. calculation. Campeau, Z. et al. "SunPower Module Degradation Rate," SunPower white paper, 2013. See www.sunpowercorp.com/facts for details. 3 Highest of over 3,200 silicon solar panels, Photon Module Survey, Feb 2014. 4 #1 rank in "Fraunhofer PV Durability Initiative for Solar Modules: Part 2". Photovoltaics International, 2014. Campeau, Z. et al. "SunPower Module Degradation Rate," SunPower white paper, 2013. See www.sunpowercorp.com/facts for details. ©2016 SunPower Corporation. All Rights Reserved. SUNPOWER, the SUNPOWER logo and SUNPOWER EQUINOX are trademarks or registered trademarks of SunPower Corporation in the U.S. and other countries as well.